YES!!! Another disaster appeal….! It is no joke, I can assure you. 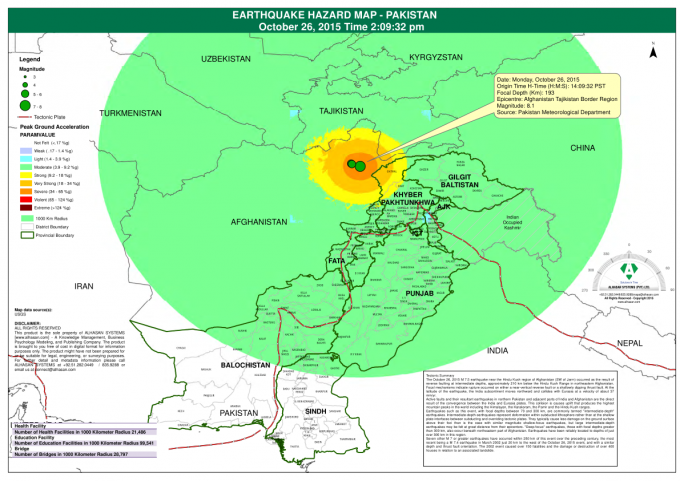 The epicentre was northern Afghanistan and the areas badly hit on this side of the Durand Line, were the Shangla area of Swat, Chitral, Dir and Peshawar. 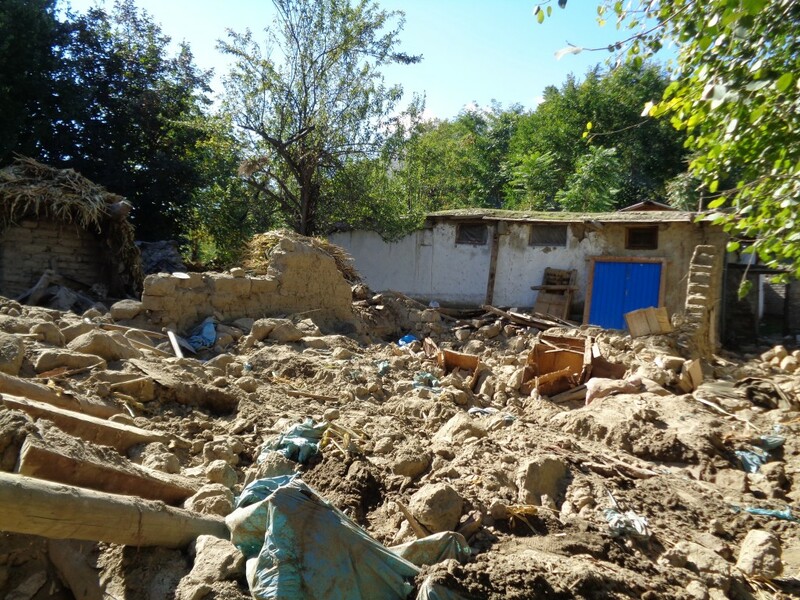 The theme for this newsletter was meant to thank those who helped so generously during the recent catastrophic floods and to inform you what we were able to do with the funds we received. Everyone helped with the food distribution in Birir. I can still do that ….Brigadier Mukthar donated one million rupees (just over £6,000) with which we bought a 20 kilo bag of flour for every household in Birir and Rumbur and over one lakh was left over to help the people of Bumburet. 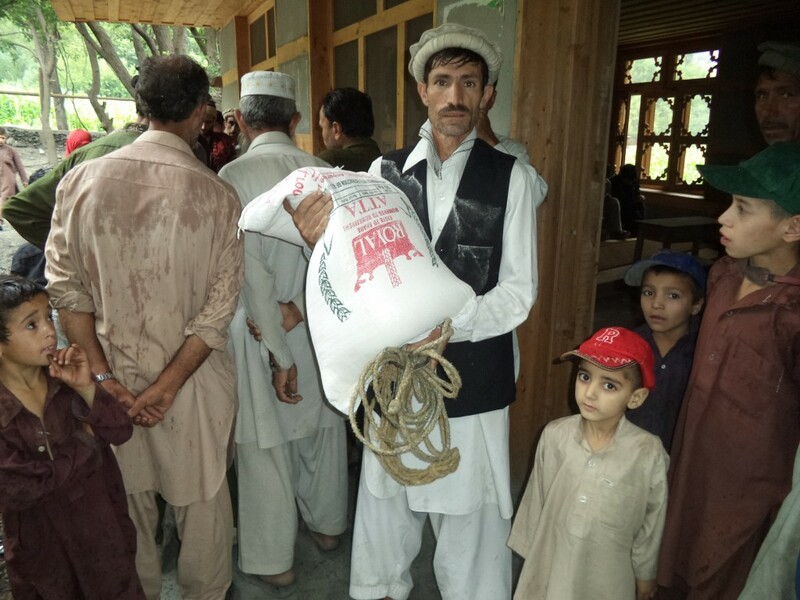 My friend Huma Beg also donated funds and together with the one lakh and with the help of the police, a number of households were helped in that valley as well so immediate food needs were financed by local friends of HKCA. 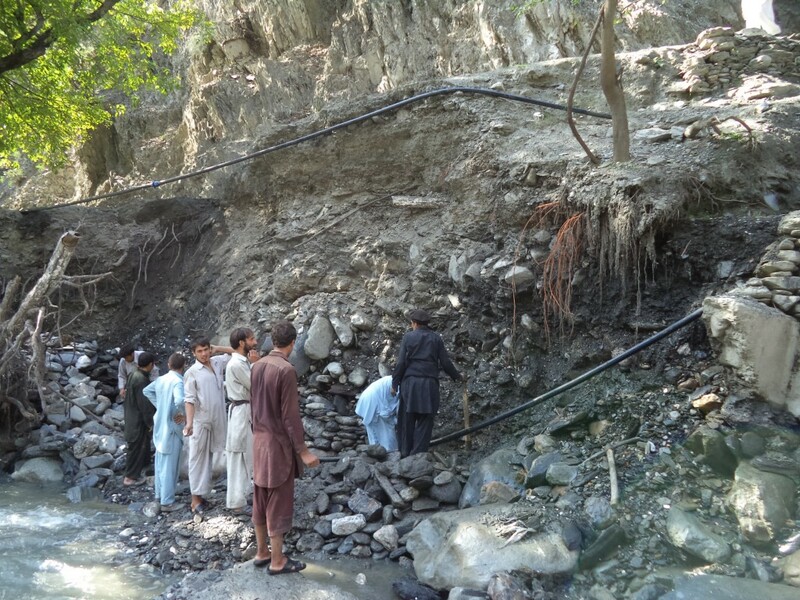 We also raised enough money in the UK to rebuild three collapsed water channels in Rumbur which feed the mills and irrigate the fields. For Birir, we raised enough to build a retaining wall to protect the school. This work has now been started. We have also restocked the dispensaries for the winter. For those of you who believe in Murphy’s Law, allow me to describe the ten days before I managed to get out over the Lowari……. The women were busy collecting corn cobs and the beans, while the men were carrying huge bundles of grass and corn stalks to storage places to feed the livestock during the winter, while the kids were scurrying around looking for walnuts, which had already been harvested but some remained for nature to discard to the ground. The road through Birir has been badly damaged. I was busy trying to improve my walking, so as to walk to Guru to climb the hillside and check out where we could build four new latrines without destroying the cultural aspect of the village. Then late one afternoon, the clouds gathered; they were dark and menacing. That night it rained and the Gol flooded….Not again! Our wood for the repairing of the roof had been lying in the Gol. It had been swept down to the main river. 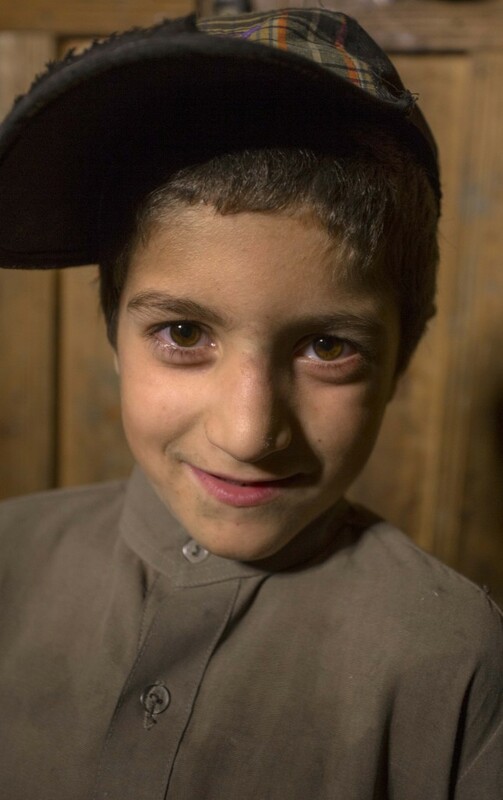 At first light, Javed raced down to the end of the Gol, ignoring his mother’s cries. He found the wood and, according to accounts, it was about to be carried off by two men. Javed, all eight years of him, told them to get lost and leave HIS wood alone. He then proceeded trying to pull the heavy logs to the river bank. He arrived home wet through from head to toe. That was the beginning of five miserable, wet, cold and dank, dark days. I have spent many Novembers and Decembers in Birir and Rumbur and have never ever known it to be so cold. The women were in distress. The beans were ruined. Not all the animal fodder was under cover. Only the kids, who went on forays searching for walnuts, enjoyed themselves, though even they were complaining of the cold. The Birir jeep track which is the only lifeline with the outside world for the valley. We were without electricity as the cement around the machinery of our small electrical power station had broken due to an earth tremor some days before. Our emergency lights were running out of charge as were our wireless loop phones. In the old days we had lanterns (we still do, but there is no kerosene in the shops) and cedar wood flares. Now the cedar wood is in low supply as is the slow burning holy oak wood. Then on the morning the sky had brightened, I was sitting by the fire in the kitchen, while Bau was outside feeding the goats, when I felt a tremor beneath my feet. Then the tremor grew more violent and the whole house was shaking. As I hastily took my feet off the opposite stool, Bau came rushing in. “You will be okay. Don’t worry! I have called the police. I go find the children.” As she rushed out, two of my security wallahs rushed in. The tremors were dying down. “No, it’s okay.” The tremors had stopped. 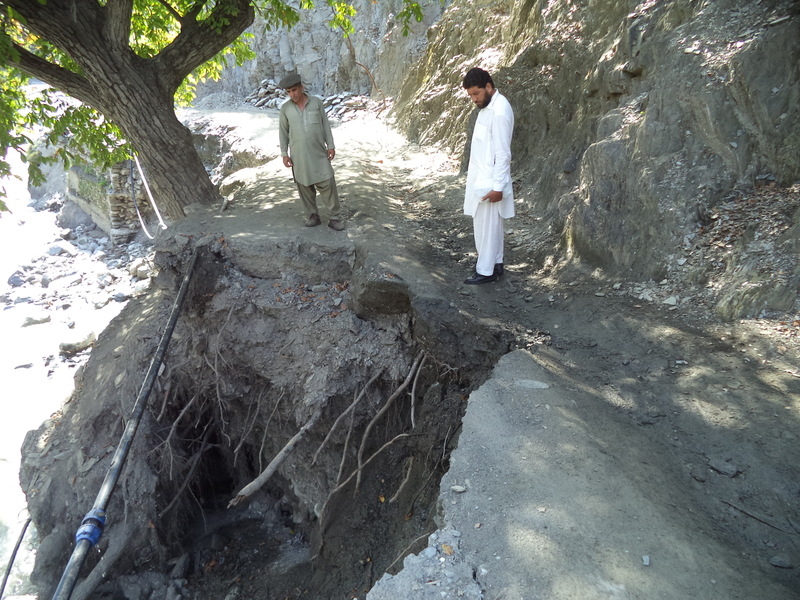 Bau returned with Javed and another child who had been climbing the hillside. She stood for a moment with her back to the wall, breathing heavily. “Phew! Much tension!” she said in Kalasha. 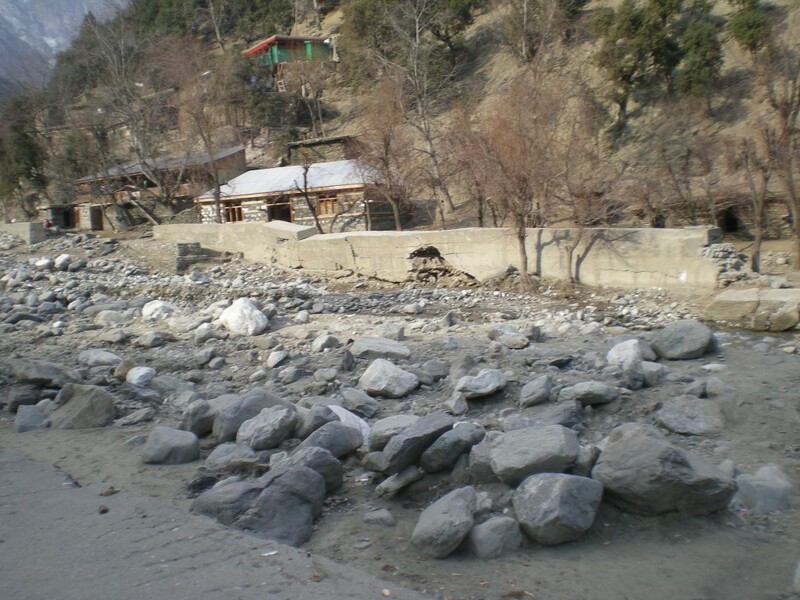 When the dust settled, we found out that although Chitral had been badly hit with many fatalities and destroyed houses, schools and hotels, including the top half of the iconic Mountain Inn and the total destruction of the Garden Hotel, the valleys had suffered relatively minor damage. Again, I recalled how the Kalash had always built their houses to withstand earthquakes. Cement, which I have fought against for years, especially when used by the corrupt, is always prone to crack. Damaged houses in Ayun. Ayun is the jump off village before the Kalash valleys. 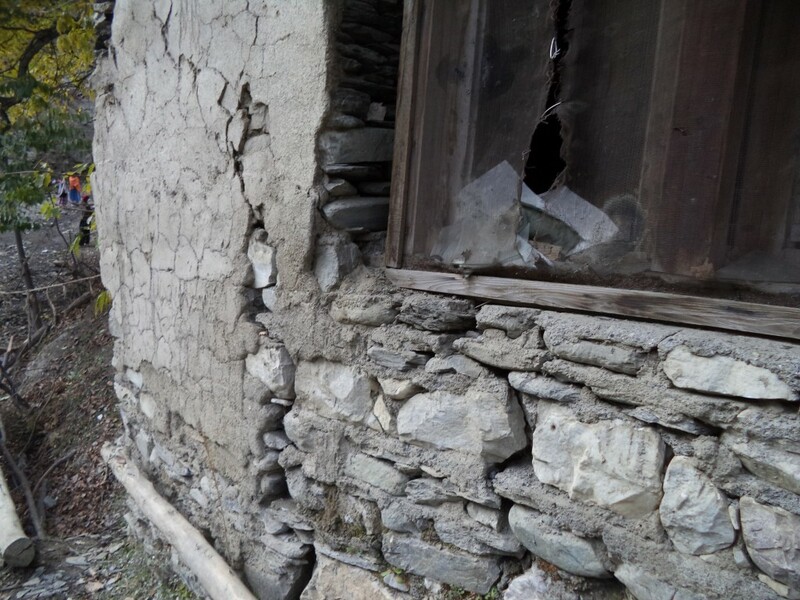 In Birir some water channels had broken or split into two, the other electrical power station had suffered much damage with the cement and destruction of the water channel, and our Bashali House in the village of Bishal, we had built some years ago was damaged. The women in the nearby village are in great distress. Now I am down here again in order to raise the alarm before the winter sets in for good, although we all wonder how much colder it can become. 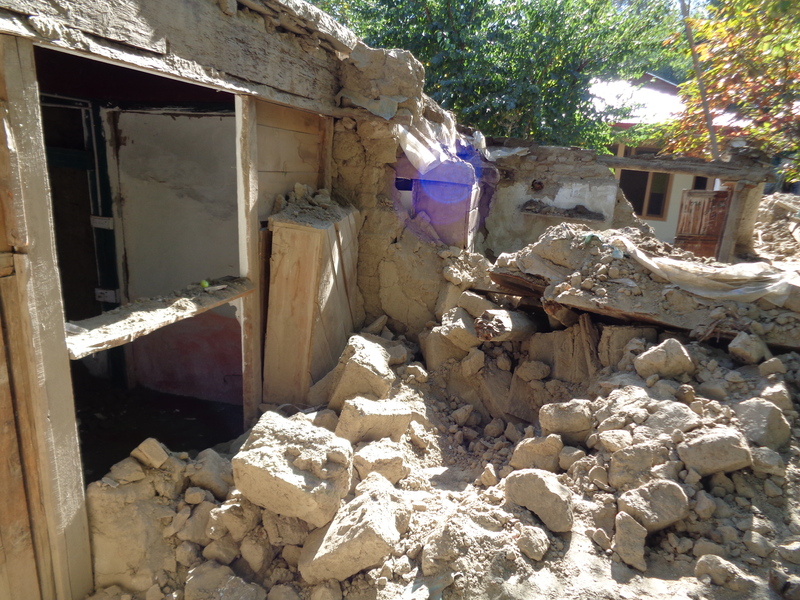 In urgent terms, we desperately need to repair the Bashali House. No government department will do that, nor repair the water channel or the cement in Aspa electrical plant. The government is in the process of building a big one for the whole of Birir but it will take a long time as they have chosen a very difficult site which means much blasting. It will take at least a year. Damage at the Aspa electricity plant. The other factors which are also important are that over 50 schools in Chitral were demolished and over 120 badly damaged. It is imperative we finish our school as soon as possible as girls have no facilities now to go out of Birir and and seek education for some time. Not only the schools, but the hostels have also been dam aged or demolished. Damaged cement retaining wall near our Bashali house in the main part of Birir. We have listed below a summary of patient treatments and costs which may be of interest to those of you who take a special interest in our patient programme. Total cost: R1,73,350 (£1090) – these have all been funded by your funding from the UK. 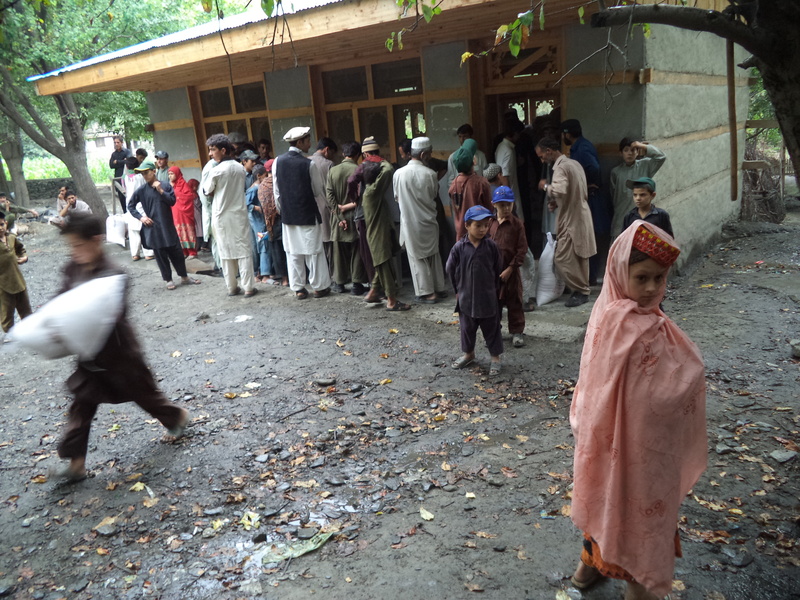 Why is it that disasters seem to strike the world’s poorest people again and again; Nepal, Pakistan, Afghanistan yet we hardly hear of it. The world’s press being more concerned with corrupt athletes and a bit of comparatively minor flooding in Kendal. The Hindu Kush Conservation Association is now registered on the website www.totalgiving.co.uk. Total Giving is a FREE platform allowing charities to maximise donation amounts. Unlike other donation websites, Total Giving does not handle any money – the donation goes instantly and directly from the donor to the charity. This is the only way to 100% guarantee the charity receives its donations. You can donate directly to Total Giving online in over 100 currencies by debit card, credit card, direct debit or by using PayPal at the link below: http://www.totalgiving.co.uk/donate/hindu-kush-conservation-association. Any questions, please do not hesitate to contact us.